Shaun Gardner, maintenance, left and Larry Plummer, superintendent, hold up the two new banners chosen by the Warsaw Parks and Recreation Board. 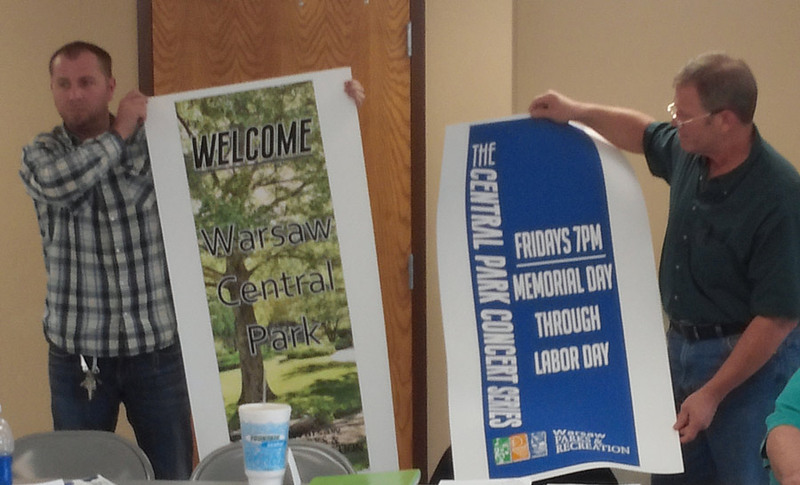 WARSAW — New banners for Central Park were approved during Tuesday evening’s Warsaw Park and Recreation Board meeting. Eighteen banners stating, “Welcome Warsaw Central Park,” and 18 banners promoting the park’s concert series will be purchased from Big Picture Imagery, Warsaw. The goal is to have the banners completed and ready to be placed on light poles by mid-April, the start of the parks season. The banners will be placed around the plaza, on Canal Street, Fort Wayne Street and the pavilion. Current banners were purchased in 2002 through a Kosciusko Convention, Recreation and Visitors Commission grant. A request was made for another grant but was denied, as the banners promote the park specifically. Board members were shown five samples, including three that divided the three sections of the parks department logo into three individual banners. Larry Plummer, superintendent, stated the logo itself was not elongated enough to include in one banner. He added if the banners were horizontal instead of vertical the logo could be included. Shawn Gardner, maintenance diretor; Larry Plummer, park superintendent; and Sheila Wieringa, recreation director, hold up three banners which have the three elements of the department’s logo: sports, music and recreation. Diane Quance, board member, suggested the possibility of looking into creating a banner with four sections, to include the logo. While a final quote for the banners has not been received, Plummer stated it is within the cost budgeted. A final quote is expected soon. Heather James, event coordinator for the 2016 Northern Indiana Lakes Festival, provided board members with an update for the two-day festival. This year’s festival will be held at Center Lake Park Saturday and Sunday, June 11 and 12. “This helps convey where and when,” James stated where in the past the events have been held at several locations. James stated the event will kick off with the Aqua Mile Swim Race. There will be games, displays, educational vendors, bounce houses, craft activities and cooking demonstration workshops. New events for Saturday were noted: a duck call competition, with the coordinator reporting entries being received from out of state and the possibility of having more divisions added; Metzger Outdoors Adventure Race; an outdoor concert with Island Breeze and fireworks display. New for Sunday includes the return of the Lake City Skiers providing a performance, art contest award presentation and an animal show. James also confirmed the approval to move the festival to Memorial Day weekend in 2017. Pat Brown, landscape architect with SiteScapes Inc., Mishawaka, presented the board with a proposed schedule for the five-year master plan update. “It is an aggressive schedule,” he stated noting the goal is to have the plan completed before Christmas adding a buffer zone before a draft is submitted to the Indiana Department of Natural Resources in January and the final plan by April 14. “Nothing is cast in stone,” Brown stated about the schedule. A public survey period is proposed between May 18-June 20, a public meeting in November and a Nov. 16-Dec. 19 period for public review of the draft. Brown stated there will be monthly progress updates given to the board. Brown will meet with Plummer to determine the best direction to go with public surveys — online questionnaires through social media or websites, mailings or select focus groups. Approved the annual Willie Chili Dogs events, pending date availability, for May 18, June 15, July 20, Aug. 17, and Sept. 14. This event will provide free chili dogs, hot dogs, water, chips between 11 a.m. and 1 p.m.
Plummer reported it was time to replace playground and exercise equipment at Lucerne Park, which were installed in the early to mid 1980s. Equipment ideas and a new layout are being considered, including exercise equipment simple to use. Work is progressing on the installation of fiber optic service and VOIP phone service to the parks office and campground area. The next meeting of the board will be at 5:15 p.m. Tuesday, April 19, at the Firemen’s Building, 1013 E. Arthur St.